Months after a 17-year-old athlete had sudden cardiac arrest and died, her friends and family continue to struggle to come to terms with the loss. Scarlett Stein was an accomplished athlete, a straight-A student and a role model in her community. Channel 11's Rick Earle had been Stein's softball coach since she was 12 years old, and said he always saw potential for her to become a great player. "She was all muscle and she was touch, she was a tank. She could hit the ball," said Dody Stein, Scarlett's mother. Stein is left with pictures and videos of her beloved daughter's accomplishments on the field. Scarlett first started playing baseball with boys teams, and then moved on to fast pitch softball on travel teams and in high school. In the classroom, Scarlett was a straight-A student who dreamed of going into forensics, and even interned with famed pathologist Cyril Wecht. "Even though she loved softball, her academics were No. 1. She made straight-As from preschool to 12th grade. She never studied, never took a book home. I don't know how she did it," said Dody. 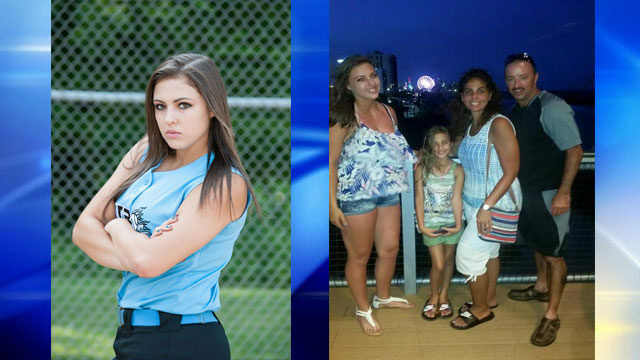 Just before her death, Scarlett had signed a letter of intent to play softball and continue her education at Penn State New Kensington. Then, the unthinkable happened. "We heard this thump on the floor, and we come out and she's lifeless. I started doing CPR on her," said Tubby Stein, Scarlett's father. The day before Scarlett's heart attack, she had passed out in school. At UPMC Children's Hospital, doctors ran tests. Her parents said they were unable to figure out what was wrong, but because Scarlett seemed to be getting better, they planned to let her go home. "We were going to pick her up after work. She was fine, get a call at 4:30 in the morning, she went into cardiac arrest," said Dody. On Dec. 14, 2016, Scarlett Stein died at age 17 from complications due to sudden cardiac arrest. "I'm stuck with wanting to be here with her, and wanting to be in heaven with Scarlett. So it literally kind of breaks your heart. Cause I feel you can die of broken heart, you really can die of a broken heart," said Dody. After Scarlett's death, hundreds of people came to her viewing and funeral, offering support. "It's unbelievable the support. People from Ohio to New Mexico and everything. Teams we didn't even know showed up for her funeral," said Tubby Stein. Scarlett's blood work was sent to a lab in California for extensive testing after her death. Her parents said doctors couldn't get her heart to pump blood, and now the family is working with the National Center for Catastrophic Sport Injury. "Well, I said if it helps another child find a reason why this happened. She had extensive MRIs, CT Scans, EKGs. During all of this in Children's and all this and every single day, and never found nothing wrong with her heart," said Dody. In 2017, Scarlett would have graduated from Jeannette High School as valedictorian and gone to her senior prom.